Penelope Carlevato is an author, speaker, and culinary expert, noted for her expertise… and her expert-teas. Founder of Penelope’s Tea Time, (www.PenelopesTeaTime.com) a blender and marketer of specialized teas; and co-hostess of the cable-TV program Cooking Up Wonders, Penelope has written a previous book on tea, The Perfect Cup, as well as many articles on the world’s favorite table beverage, plus a bi-monthy food column for the new magazine, Leading Hearts. Born in England to a war bride, and reared in South Dakota, Penelope learned the arts of hospitality and the special role of teas and tea-time etiquette from her mum. She has expanded her proficiencies as an Ambassador of Tea – as a hostess of tea-time ministries, instructor of “The Art of the Afternoon Tea,” and guide of an annual “Taste of Britain” tea tour, and “Tea on the Titanic Tour” to Ireland, Wales and England. Penelope and her husband Norm live in Colorado, and are parents of three children and grandparents of eleven future tea-lovers. Her background, and the universal fascination with the Titanic, “stirred” her interest to research the social ambiance and unique menus of Afternoon Teas and High Teas on the High Seas, 100 years ago. Tea on the Titanic is not just interesting history and surprising details about bygone times, but a collection of great recipes! 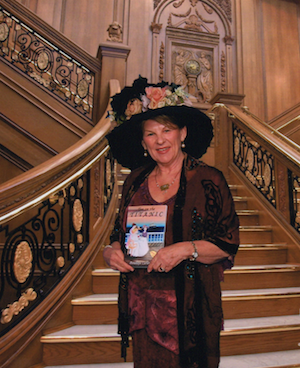 Penelope is a speaker that will delight your audiences with many wonderful, historical facts about the Titanic, and especially those who are as fascinated as she is about the social issues of a by-gone era. 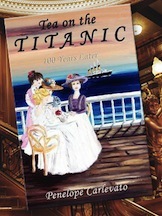 “Tea on the Titanic”…available at Amazon, B&N, House of Commons, Molly Brown House, Titanic Historical Society, Titanic Museum, BoulderTeaCo.com, The English Teacup, TheBeesKneesBritishImports.com and other fine tearooms and bookstores.